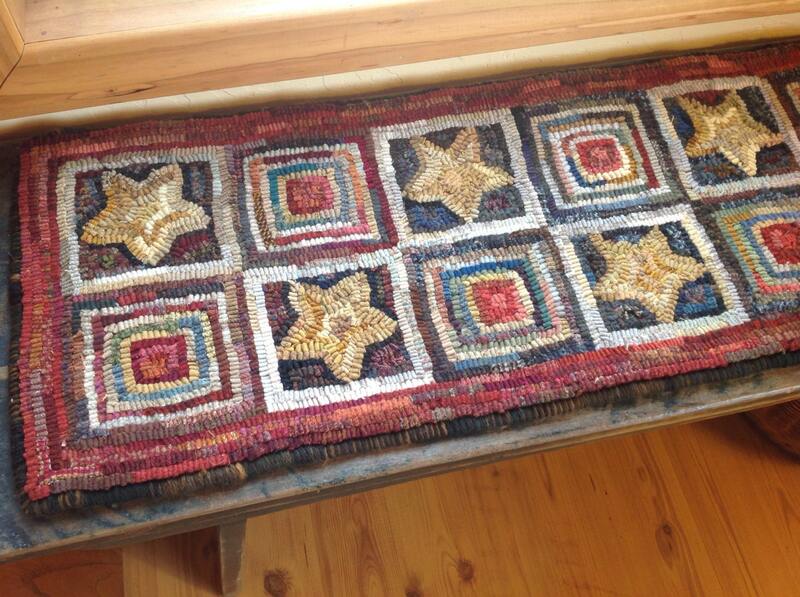 This listing is for the rug hooking PATTERN "Star and Log Cabin Runner", 12" x 47" on your choice of cotton monks cloth or primitive linen. A 4" x 6" photo is included. Monks cloth is good for all cuts of rug hooking. 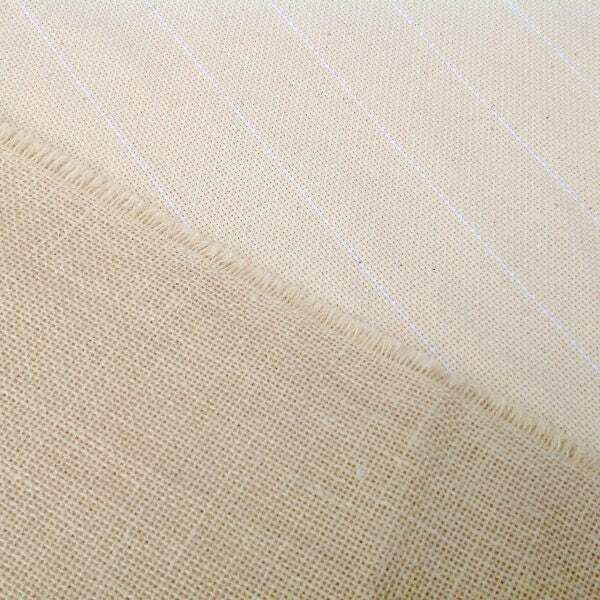 Primitive linen is best for #7 cut and wider. I used a #8 (1/4" wide strips) to hook my version. 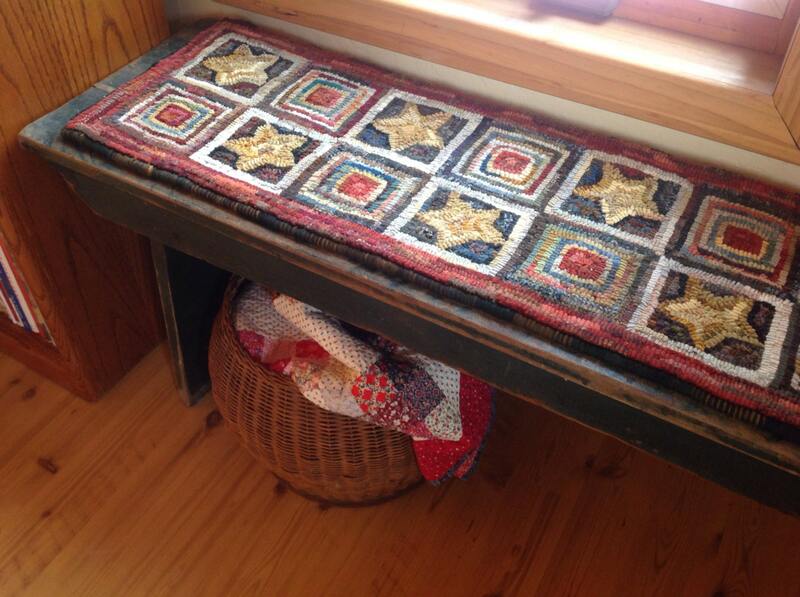 For this design I added one of my favorite motifs, "stars", and combined it with one of my favorite old quilt pattern blocks called "Log Cabin". The center square is usually red and signifies the hearth of the home. Using all leftover 1/4" strips of wool, I first divided them into baskets of lights, darks and mediums. I hooked the middle square using varieties of red strips, then alternated rows of light and medium to fill out the square. The stars are random golds with a crazy mix of darks for the backgrounds. I have hand drawn the design with permanent black marker on the backing fabric. The border lines are carefully drawn to stay on the straight of the grain. Four inches of extra backing fabric surround the design to make it fit on most rug hooking frames or in a 14" hoop. The raw edges of the backing fabric have been serged to prevent raveling while hooking. Love it and can't wait to get started working on it after my current rug! Very prompt shipping.This rug pattern should work well to use up all the extra wool strips that I have on hand! Thanks.